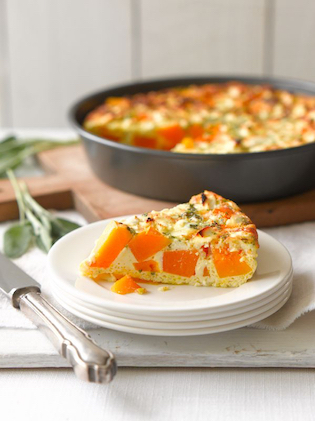 A big frittata makes a great family meal, lunch dish, or picnic feast. This recipe is an excellent base for a huge variety of flavours, and is also great for using up leftovers such as roast vegetables. Other good frittata combinations include: pumpkin, bacon and thyme; or potato, cheddar and broccoli. 1 Heat oven to 190°C. Spray a large cake tin (not loose-based) with oil. Arrange cubed kumara over the base of the pan. Scatter with spring onion. 2 In a bowl, whisk eggs with milk to combine, then stir in sage and season well with salt and pepper. 3 Pour eggy liquid over vegetables and sprinkle with feta. Bake for 35-40 minutes or until golden brown and set. Serve hot or cold. Chef’s trick: Any other vegetables can be used in place of the kumara, if preferred. Try florets of broccoli or cauliflower, leeks, courgettes, peppers, pumpkin, leftover roast potatoes, or even mixed frozen vegetables. Add ham, bacon, salami, or canned tuna for meaty options. This entry was posted on September 25, 2017 by julie.